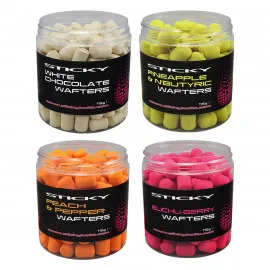 Sticky Baits invest a huge amount of time doing product research, which means going on an extensive search to find only the freshest and most innovative ingredients from around the globe. Countless hours are then spent on product development, until the brand has a product which, on paper, is the perfect match for the carp. However, it also understands that what works on paper may not work quite so well in the water, as there are all manner of external elements that can impact the success of the bait – including the whims of the fish on the day! This is why it works with some of the biggest names in carp angling, such as Adam Penning and the legendary Martin Bowler. Names such as these rigorously test all the products, sometimes for up to two years before they are released on the market, to ensure that the product you pick up from the shelf is the very best that the company has to offer. It is only after the final tweaks have been made that Sticky Baits can be confident that the product they are releasing is not only going to provide the fish with a well rounded meal – which is vital for sustainability of fish growth – but will also trigger an unparalleled feeding response from the fish. It never puts its carp bait into full production unless they can be confident in these two factors, no matter the time and money invested in the product research and development. 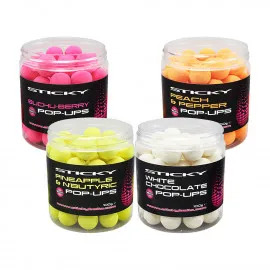 All of Sticky Baits products are created on site in its very own purpose built state of the art factory. Even the smallest detail is considered when producing the baits. From the water filtration system to the walk in deep freezer, it is always looking for that extra ‘one percent’ that will make its products a cut above the rest. After all, all those one percents accumulate into something much bigger, and add up to create a product that it has complete and utter confidence in. As the products are created from start to finish in-house, Sticky Baits has complete control over the product at each stage. For example, all the ingredients are temperature and moisture controlled whilst they are in storage, so the quality remains as superb as they were the day they arrived in the storage warehouse. This means that It knows exactly what is in each boilie before it leaves the warehouse, right down to the little morsel at the bottom of the bag. Most importantly for you as the angler, Sticky Baits puts all this effort into the bait to show real results on the bank. Anglers who use Sticky Baits see these results time and time again, and like to show their support for the brand by sporting an item from its clothing range.